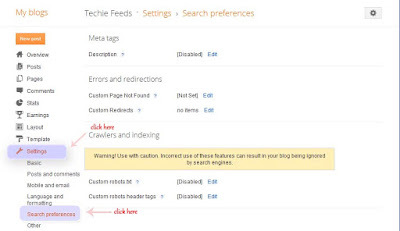 BLOGGER SEO MADE EASY WITH SEARCH PREFERENCE OPTIONS ON NEW UI. Good news for all Bloggers..! 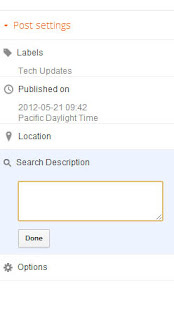 Blogger has been introduced a new search preference option. 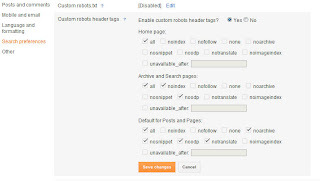 Now bloggers can easily add meta tags, customize Robots.txt, Redirects, 404 Error page, and alt and title for images. SEO is a majot part of any website / blog to list on search results of search engines. Before, during the old UI, blogger had not supported SEO. But now, in new UI of blogger, the SEO fuctions are fully functional and dynamic. Now you can set meta tags for each posts and Robots tag separately. 2. Custom post meta description. 6. Couston Robots header Tags. 7. Alt and Title tags for Images. Go to New Blogger Dashboard > Select the blog and select settings Tab > Search preference. This is the general description of Home page to optimize the Home page / Blog. And visible on the seach results. 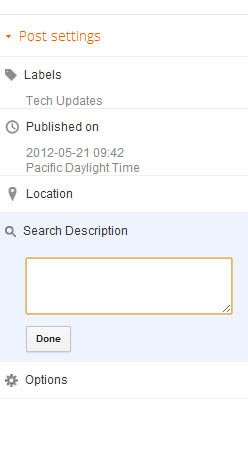 Search Description should be a short description about your blog and max. 150 characters in English. The search description may disabled in default. You need to click on the Edit button > the Yes. hence description can written on the white box. max. of 150 letters. This is the custom Post Meta description for each and every individual post.You can easily set and customize the Each post while creating it or editing the post area. It is placed on the left side of the post editor. This is also a new option from blogger. Say Good bye to blogger default 404 page not found error page. Now you can customize your 404 error page. This redirect is 302 temporary and redirection is send through HTTP Headers..
Blogger has provided to edit and customize the robots.txt file. This is the key file for seach engine bots. Robot.txt file for Techie Feeds is : http://techiefeeds.blogspot.com/robot.txt. 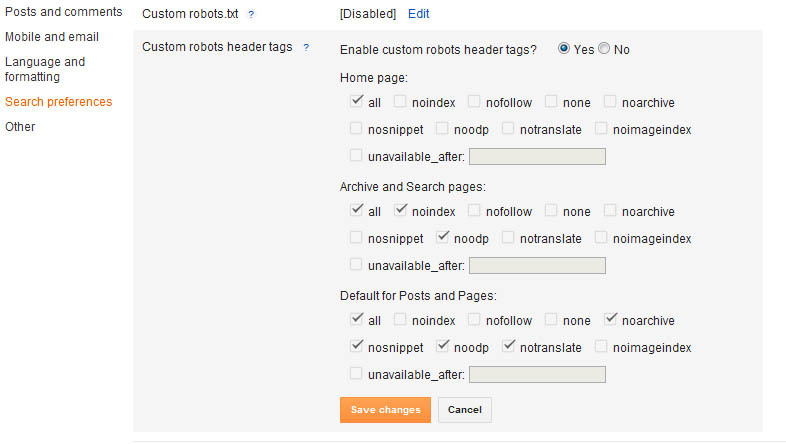 Warning : Changing or Modifying the Robot.txt file wrongly may effect visibility of blog on Search Engines. 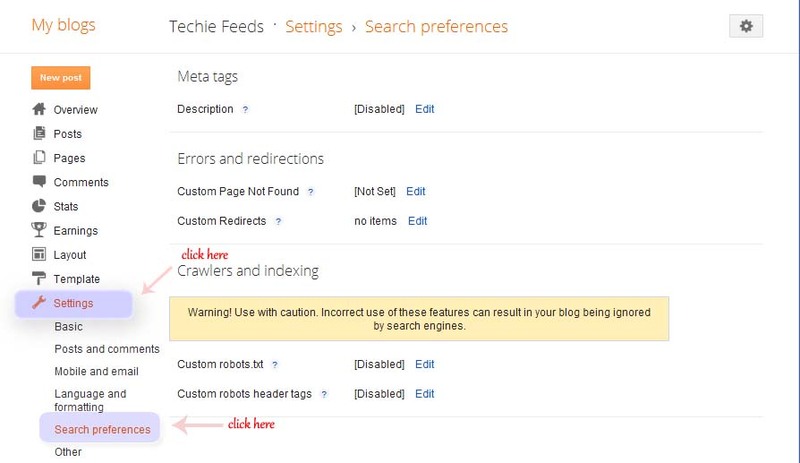 You can set the Robots tags to home page, Archive/label pages, Post pages on Crawlers and indexing Searching on search preference tab. Alt and Title tags for images helps for indexing images. Your images are easily indexed by image bots like Google Image bots. 1. Upload and Add the Image. 2. Click on the Image. 4. On the popup prompt, Enter the Alt and Title tags for your Image. Thanks for reading this Post. If you have any question or comments, Feel free to let me know!